Will You Dare Step in the Arena? Maximus: I think you’ve been afraid all your life. Wednesday night I had the opportunity to attend the Zappos For Good Speakers Series at the Smith Center in Las Vegas, NV. I was excited about this, the speakers were Dr. Brene Brown and the folk singer, Jewel. Brene’s topic for the evening was courage and vulnerability. She said the two go hand in hand. To be vulnerable takes courage. We have to be willing to step into the arena and bare our souls to the world, to fail and get back up again until we succeed. When we’re in the thick of it, we never see ourselves as courageous. We do what we need to do at the time to survive. Critics and naysayers may see us as weak as they point their fingers and put us down for failing. They will tell us we’re not good enough, what we’re doing is pointless, that our ideas are stupid and will never work. Look closely at the piece of dialogue from the 2000 film, Gladiator, starring Russel Crowe as Maximus and Joaquin Phoenix as Commodus, the Emperor. Commodus was so jealous of Maximus’ relationship with the previous emperor, Marcus Aurelius, Commodus’ father. Commodus was so certain he’d be next in line and when Aurelius chose Maximus, a general, instead of his own son. From that point on, Commodus set out to tear Maximus down and take everything away from him. Maximus lost his army, his family, his life as he knew it. He could have given up at any point, but instead, he kept getting up and driving himself forward. Was he afraid? Yes. Was he vulnerable? Oh hell yes. Meanwhile, Commodus hid behind the throne and did everything he could to control and manipulate those around him to bring about Maximus’ doom. Even going so far as to drive a knife into Maximus’ side minutes before they fought. This is what the critics in your life and in your head will do to you. They will beat you down without ever stepping in the arena themselves. They watch from the bleachers and box seats, comfortable and far from the blood-soaked dirt. They’ll tell you you’re doing it all wrong. They’ll laugh as you fall and struggle to rise again. They will avoid failure, they will put up numerous facades to save face and perpetuate the illusion of power. The real power belongs to you, the gladiator in the arena. Why did the public love Maximus so much? He wouldn’t stay down. Nothing could keep his face in the dirt for long. He had hope, he had heart. He had the will to live. Maximus also believed in what he was doing. He believed in honor and integrity. He didn’t want riches and power. He wanted to do what was right. Commodus, on the other hand, was all about the bling and Aurelius knew this. Aurelius chose Maximus because the general had no desire or ambition to become emperor. Maximus’ vulnerability and courage brought light to the darkness. Later on in the presentation, Jewel talked about being broken. She said, life doesn’t break us—it breaks us open and allows our light to shine. Look at yourself. Are you a gladiator or an emperor? Which would you rather be? Will you hide behind the stories others create for you or will you strike fear into the hearts of your critics? 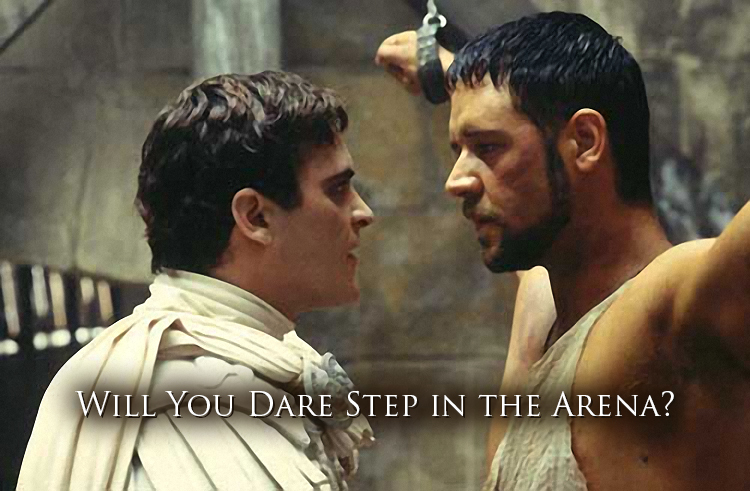 Only you can decide where you stand in the arena. Need some personal training before you go hand to hand with your critics? Start with our Journey to the Center of Your Heart six week self study course or contact us for more in depth coaching today. « Why Isn’t My Book Selling?